Do you hate typing the same /zgoo xxxx commands or other slash commands over & over? 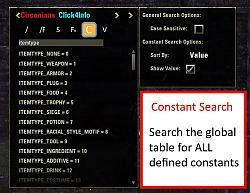 Do you hate having to alt+tab out of the game to look up function names, constants, & values for constants? 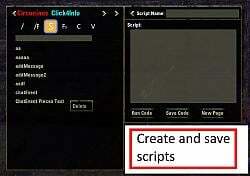 Do you want to write scripts "In-Game" to test code instead of alt+tabbing out writing some code & reloading the UI? 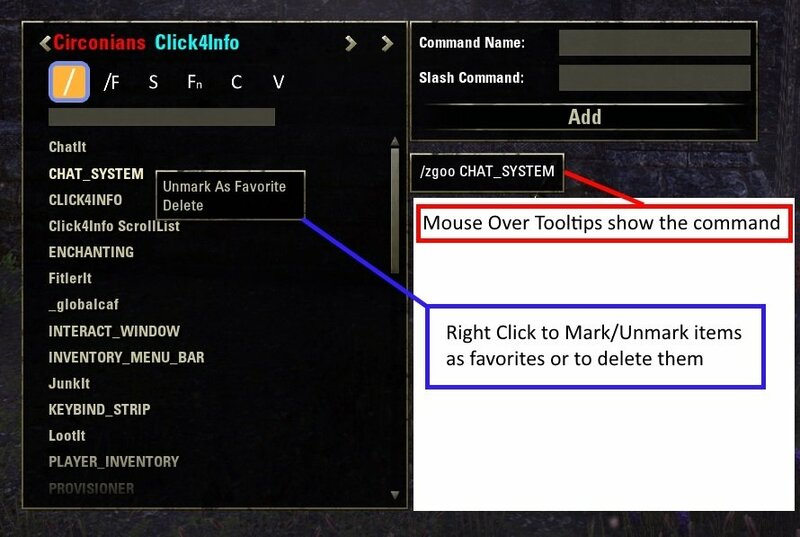 Allows you to save slash commands in an easy to view scroll list and run them at the click of a button. 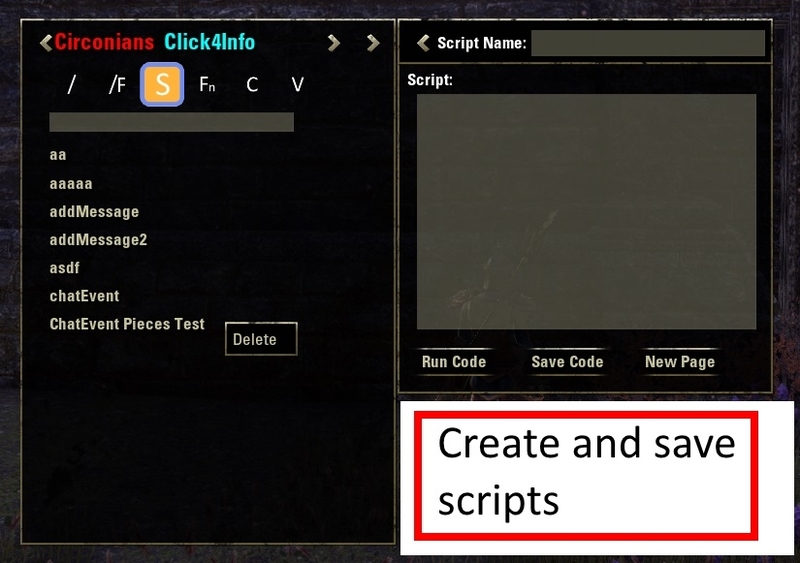 Allows you to create, save, & run scripts from In-Game. Allows you to search for all globally defined functions and constants by typing text in a search box. Allows you to search for all globally defined constants by value (type a value in the value search box). Creates a scroll list that allows you to add slash commands & scripts to for easy access. Toggle categories by clicking on the buttons in the menu bar, categories: All Commands, Favorites, Scripts, Function Search, Constant Search, Value Search. 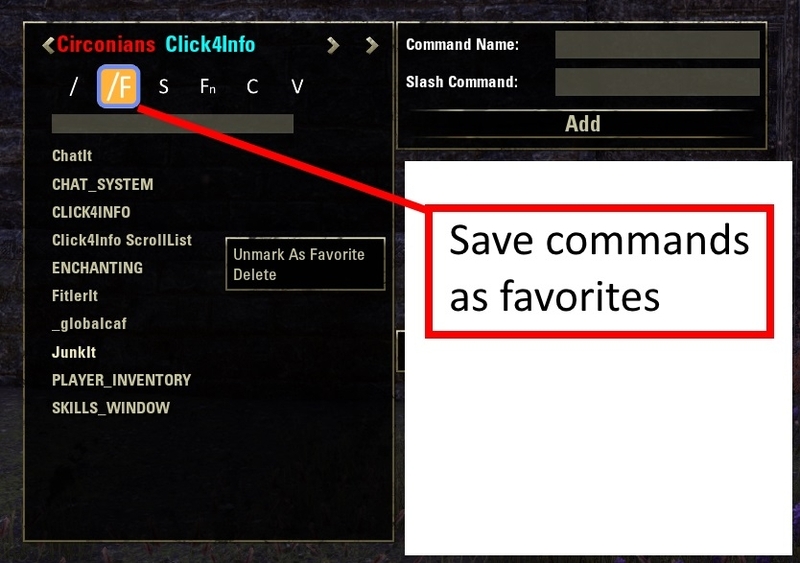 You can add/remove slash commands from the favorites (or delete them from the) list by right clicking on them and choosing the appropriate item from the drop down menu. 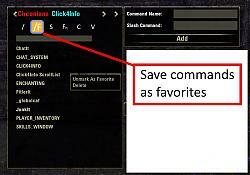 Have a long list of saved commands or favorites and need to find something? Type text in the search box to search for it. Can't remember what that GetItemXXXX function was called? 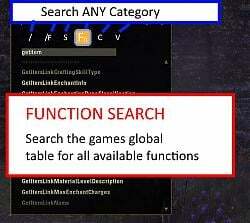 Find every (up to date) function in the game by doing a function search!! Click on the Function search button & type in some text and it will return the name of every defined (global) function in the game with that text in it !!! Need to know what kind of ITEMTYPE's the game has? Click on the Constant Search button and type some text in the search box and it will return every defined constant in the game with that text in its name!!! Have some strange value showing up in one of your functions or need to track down a constant by its value? Click on the Value Search button and type in a number to search for. It will return every defined constant in the game with that value !!! Slash commands for changing the Games language. 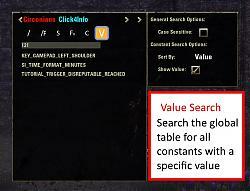 Value Search The value search feature now searches for values of type "number" and type "string" (previously it only searched for values of type "number") The case sensative option does apply to string value searches!! LibCustomMenu Added LibCustomMenu Version 2. Constant Search The constant search feature was only searching for constants of type "number" and ignoring those of type "string". That has been fixed. Bug Fix Fixed a bug that would sometimes tell you a script already existed & would not let you save it (even when editing that script). Save Window Position The main window position will now be saved when you move it. Saved Window Size The main window size will now be saved when you resize it. Code Changes A few other minor code changes/improvements/fixes. Any specific problem? The addon works fine as far as I am aware? Quick question does this have a working /zgoo mouse like function? There is a keybind for "/zgoo mouse", a free mouse, reloadui, & one to toggle the Click4Info window. But you do have to have zgoo installed & turned on for the "/zgoo mouse" keybind to work. The free mouse keybind gives you the mouse cursor, like pressing the . button, except that performing actions like moving or opening/closing ui panels will not cause you to loose the mouse cursor. The only way to get out of mouse cursor mode is to hit the "free mouse" keybind again to turn it off. I find it very useful when trying to work with the ui & the zgoo window because you wont loose your mouse cursor when performing different actions. You can also create, save, & run any slash command from within the Click4Info slash command list. I use it to run all of my "/zgoo xxxx" commands. I never type "/zgoo xxxx" anything in chat. It doesn't just have to be for zgoo slash commands though, you could use it for any slash commands. 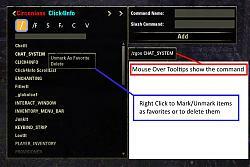 Then you can run them by clicking on it in the slash command list (the / button in the menu bar). Last edited by circonian : 11/22/15 at 06:06 PM. Great tool, keep up the good work. Is there any way to see function variable list? Still It forces me to alt-tab it to check how many variables that function returns. Write now it just searches the global table for your search string. To do what you asked all of the functions, parameters, & returns would have to be manually written into a file/table & the searches would need to be conducted on that information, there is no API to get that information...which would be a LOT of work & very difficult to keep up to date. 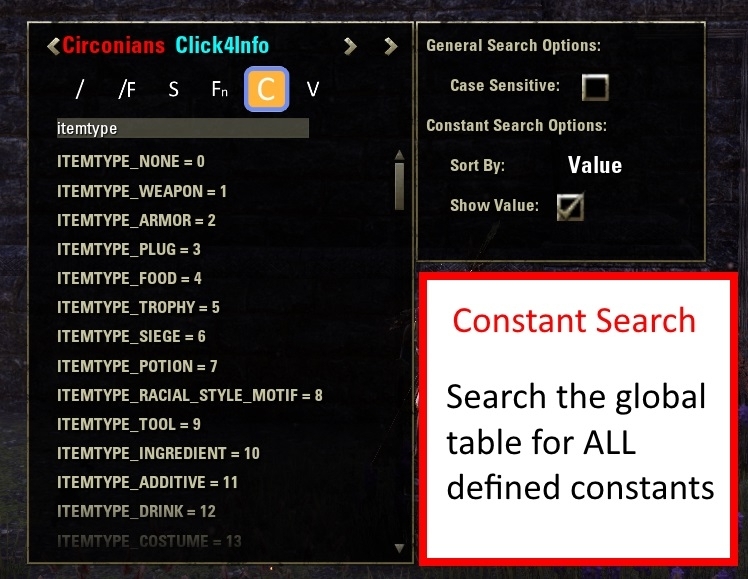 One of the upsides to searching the global table instead is that it is always up-to-date because it takes the information directly from the game and its a lot faster than trying to alt+tab out & search a web page for keywords. But your right the downside is if you don't already know the parameters or returns you have to look them up. Last edited by circonian : 06/08/15 at 02:11 PM. Really great addon. Was of much help for me to get to know the API and try out stuff! Thanks for commenting glad to hear someone besides myself got some use out of it. I made a lot of changes to try and make it semi presentable and added a few extra info options I thought people might find useful before posting. I did test it afterwords, but if you find any errors or have any suggestions of anything else you think might be useful to add let me know. I really like the idea. I will have to give it a try. Last edited by Garkin : 10/10/14 at 09:18 PM.